The name of the owner of this statue is regrettably not preserved, as only the very beginning of an inscription has survived. This text would in full have expressed a wish for offerings to be left for the owner, perhaps in a temple. It shows a man seated with (originally) both his hands placed on his lap. 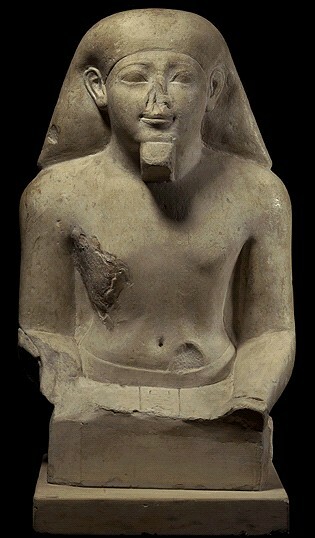 The style of the statue with its long simple wig, short formal beard, and faint confident smile is typical of the middle of the 18th Dynasty, perhaps of the reign of Thutmose III or thereabouts. Note the so-called 'negative space' between the upper arms and the body, as the arms and legs of Egyptian statues in stone are rarely separated from the main block which forms the body of the object. Although statues such as this were usually brightly painted, there are no traces of color surviving.